Suspicions that GM would kill the Saab brand might have decreased lately since the car have seen a boost with the Aero X concept vehicle and a new advertising campaign “has raised its exposure and helped increase sales”, according to the Detroit News. “Any questioning of Saab’s future is over,” Jay Spenchian, general manager of Saab USA, said. 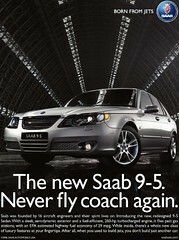 Saab sold 10,847 cars worldwide in April, an increase by 2,5 percent compared to the same month in 2005. The US is the largest market, with 50 percent more sold cars than in Sweden. Previous Previous post: PR misc.